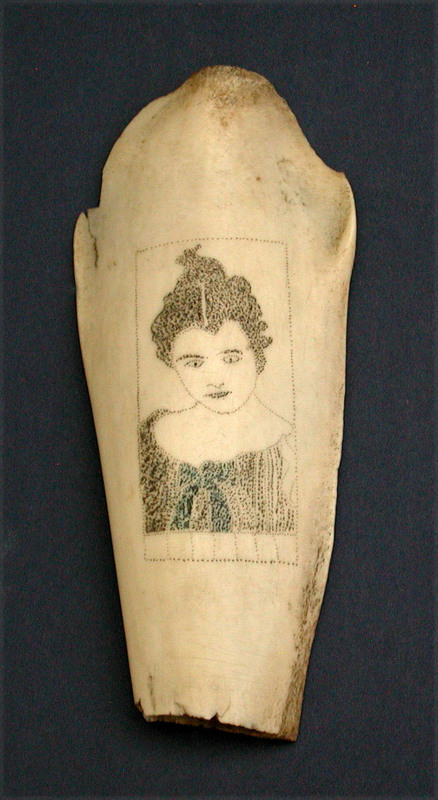 SMALL SECTION OF A PORPOISE JAW with a scrimshaw portrait of a young girl within a simple frame. Engraving done using a stipple method which incorporates a dense amount of small cuts to create the image. The bow on her dress is highlighted in blue. 5 1/2" h. x 2 1/2" w. The reverse with two collection labels still attached. One labeled "THE COLLECTION OF BILL PEARSON". The other being hand written "Coll. of. S. Hubbard/1883". Condition excellent. Light age color. Circa 1850.